Anita (left) and Debbie (right) deliver members' checks to Rebecca Hines at Destiny Diaper Bank in Ft. Myers. Nancy Tedros, 100+Women Who Care member, makes a presentation for Destiny Diaper Bank of Ft. Myers. Presentation of checks to PACE at March 2016 meeting. Anita Siegal and Debbie Laites (right) present checks to March 2015 charity, Voices for Kids. 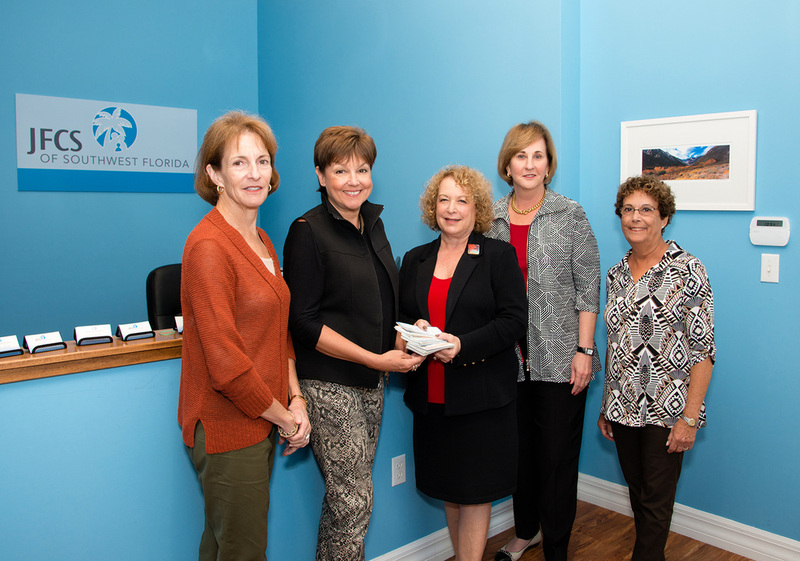 February 2015: Presenting donations to JFCS of Southwest Florida are Debbie Laites, Sheil Gea (cofounders of 100+Women Who Care), Jaclynn Faffer (President/CEO of JFCSSWFL), Barbara Wolfort (co-founder of 100+Women Who Care), and Liz Jeffee (volunteer at JFCS and member of 100+Women Who Care). March 2014: At their officers in Ft. Myers, OUR MOTHER'S HOME is awarded $7000, the proceeds of the March 2014 meeting. From left, Sheila Gea (100+Women co-founder), Karen Watson (OMH Executive Director, Debra Newell (OMH Board President), and Debbie Laites (100+Women co-founder). We proudly donated $13,800 from the January 2015 meeting, to COLLIER HARVEST FOUNDATION, at their warehouse in Naples. From left: Barbara Wolfort, (co-founder of 100+Women), Jim Iacovino (CHF Board President), Connie Preu (CHF Exec. Director), Anita Siegal and Sheila Gea (co-founders of 100+Women), Jeannette Finn and Cynthia Sharpin (CHF volunteers and 100+Women members). February 2014: Checks totaling $7100 are presented to MEALS ON WHEELS of BONITA SPRINGS at the First Presbyterian Church where meals are distributed to volunteer drivers. Pictured are Patsy Carter-Rattigan, Debbie Laites, Eileen Johnston, and Barbara Wolfort. Patsy and Eileen are MOW volunteers and members of 100+Women Who Care of SWFL. January 2014: BEDTIME BUNDLES of Marco Island accepts over $8000 at their offices and distribution center. From left, Karen Saeks (founder of Bedtime Bundles), Sheila Gea and Barbara Wolfort (100+Women co-founders), and Dennis Pidherny (Executive Director of Bedtime Bundles). March 2013: Sheila Gea, representing 100+Women Who Care, presents donations to W.I.N.G.S., the first charity funded. Next to Sheila is Pat Holmes, co-founder of W.I.N.G.S., and Nancy Moylan, W.I.N.G.S. board members, and Amanda Jaron, W.I.N.G.S. do-founder.